The HKS RB26DETT 2.8L kit is specially designed for Nissan's RB26DETT engine. Fully forged & balanced counter crankshaft. H cross section connecting rods. To cylinder block and baffle plate et cetera Escaping processing becomes necessary. Forged piston kit (nickel plated & piston surface has a final molybdenum coating). Piston material is specially forged to HKS specifications. This ensures high strength, durability, reliability, and produced to high dimensional accuracy. As a result, this forged piston enjoys tremendous weight savings, and a well balanced part. The piston crown has a balanced & symetrical concave section design which ensures higher engine response. 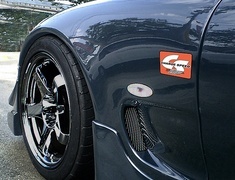 Any larger concave section will result in a drop in compression ratio, and will affect engine response. To reduce abrasion resistance, and to improve performance, the top piston ring is titanium coated. In order to acheive an overall low piston height, piston design with two thin piston oil rings is adopted by HKS. This ensures minimum friction, and a low tension type piston. With the use of high pressure forging for the material, the part does not requires much secondary operations except for the mating bearing surfaces. High tensile bolts are used to prevent cap opening during high inertial forces generated at high RPM loads. The strength of the crankshaft is ensured when the metal fiber flow is not affected during the forging process. It is a full counter form, balanced to high tolerances where smooth revolutions are ensured. This results in loads being evenly distributed onto the metal surface, and reduces frictional loads. The rigidity of the pin side is improved with the addition of a rib to the connecting rod pin. 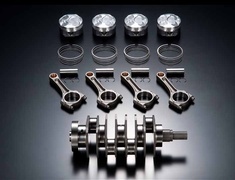 The crankshaft manufacturing process is completed with a special hardening process according to HKS specifications to ensure increased reliability at high RPM loads, and reduce fatigue.